I have always been drawn to the teaching of the Rebbe of Kotzk. His approach was predicated upon uncompromising truth and intellectual independence.This allowed him to be fearless and never to succumb to societal pressures. He knew that Judaism was so much deeper and more profound than the way it was perceived by the masses and bent by religious populism. These essays, although not necessarily Kotzker in essence, are certainly Kotzk inspired. R. Yechezkel Landau (1713-1793) - also known after his Halachic work, as the Noda biYehudah – was born to a wealthy and influential family in Opatow in Poland. His father, R. Yehudah, was very involved in communal affairs and became one of the leaders of the Va’ad Arba Aratzot or the Council of the Four Lands. This body, based in Lublin, was in existence for two hundred years and took care of Jewish communal, religious and political affairs. Thus, R. Landau grew up in an environment which was rich and knowledgeable in communal realities. At the age of twenty, he was appointed as dayan or judge of the Court at Brody, a position he held for eleven years. In the 1700’s, the Council of Four Lands moved from Lublin to Yaroslav and in their last session in the fall of 1753, it adjudicated the famous Emden/Eybeschutz controversy. This was where R. Ya’akov Emden accused R. Yonatan Eybeschutz - no less a personality than the Chief Rabbi of Prague - of being a secret Sabbatean or follower of false messiah Shabbatai Tzvi. During that session, R. Eybeschutz was acquitted of Sabbatean heresy - and it was none other than R. Landau who had sat in judgement during that bitter trial. The reason why they chose R. Landau to reside over that cataclysmic controversy was because he was respected as both a Talmudist as well as a Kabbalist. And he lived up to his reputation because his judgement on this matter was considered so sensitive, fair and neutral, that he attracted the attention of the entire Jewish world – to the extent that when the position of Chief Rabbi later became available in Prague, it was offered to him. People flocked to R. Landau for advice and Halachic guidance and the constant practical application of his scholarship thus broadened the material for his Sha’alot uTeshuvot or responsa work – the Noda biYehudah - which he named after his father. Although the false messiah Shabbatai Tzvi had died almost a century earlier in 1676, there was a multitude of secret Sabbatean cells all over Europe, still spreading his message. Shabbatai Tzvi had mastered and then abused the Kabballah of the Ari Zal. This explains why his teachings were of an extremely mystical nature and had much allure. He had also produced a Sabbatean Kabbalah and his teaching found ripe audiences across the Jewish and Torah world. He had taught that sometimes one needs to intentionally enter into the sin in order to ‘elevate’ it and thus hasten the redemption. This was a very dangerous notion and some of his followers were known to have been promiscuous. More than half of the Jewish population, including respected rabbis, are said to have followed Shabbatai Tzvi before his conversion to Islam in 1666. And many continued to follow his Kabbalah even after his death ten years later. Rabbi Dr Maoz Kahana (with whom I have communicated and admire greatly as a scholar and an absolute gentleman) has written in depth about the post-Shabbatai Tzvi period, and I have drawn - in this article - from his extensive research. As part of his investigation, he dated and revisited lost manuscripts, fragments and personal writings relating to R. Landau and the Sabbatean issue. He refers to the disturbing phenomenon of “the percolation of Sabbatean ideas into mainstream [including rabbinical] writing”- even almost a century after Shabbatai Tzvi’s demise. Many Sabbatean ideas were discreetly disseminated even within the pages of mainstream prayer books and other rabbinical works which were commonly found in many homes at that time. [See KOTZK BLOG 168]. Sabbatean literature got interspersed within normative Kabbalistic literature and it was often hard, even for the trained eye, to distinguish one from the other. During the Emden/Eybeschutz debacle, R. Landau compiled his famous and crafty letter of compromise which he hoped would put the controversy to rest. He addressed his letter to the heads of all the main Jewish communities. While R. Emden had accused R. Eybeschutz of distributing amulets with Shabbatai Tzvi’s name on them, R. Landau took a middle of the road approach. He expressed disapproval only of the amulets, but he did not condemn R. Eybeschutz personally. R.Landau was known to have encouraged good relations with all people including non-Jews and was considered to be a model and patriotic citizen. When Empress Maria Theresa (the only female leader, and the last, of the powerful Hapsburgs)died, it was R. Landau who delivered the eulogy. This is even more notable considering that Maria Theresa was once regarded as one of the most anti-Semitic rulers of that time. She even considered expelling the Jews from her realm. She wrote of the Jews: "I know of no greater plague than this race, which on account of its deceit, usury and avarice is driving my subjects into beggary. Therefore as far as possible, the Jews are to be kept away and avoided." However, toward the end of her life she offered the Jews protection and opposed forced conversions to Christianity, permitted Jewish schools to open and for Jews to participate actively in commerce. I did some research of my own and discovered that one of the reasons why Empress Maria Theresa, although an avowed anti-Semite, changed her attitude and actually ended up being very favourable to the Jews – was because of a Jewish courtier whom she greatly admired, Avraham Mendel Theben. He had the ear of the Empress and used his influence to release Jews who had been falsely imprisoned as a result of a blood libel as well as convince her to adopt other reforms which were favourable to the Jews. It turns out that Theben’s daughter was married to R. Mordechai, the son of R. Yonatan Eybeschutz! Perhaps this was one of the reasons why R. Landau did not want to antagonise R. Eybeschutz. And perhaps this is why R. Kahana refers to R. Landau’s soft compromise on R. Eybeschutz’s Sabbatean controversy - as him “turning a blind eye” and making “convoluted efforts to resolve the confrontation”. “I have come to awaken the hearts of all the great men of the land regarding the books of magic and heresy that have been found in our country . . . [that aim] to deny heretically the basic truths . . . to uproot and remove all traces of the root of the belief of Israel . . .
From the letter we see that R. Landau was less concerned about the matter of R. Eybeschutz’s alleged personal use of Sabbatean amulets, and more concerned about the more dangerous issue of the masses confusing Sabbatean literature with holy mystical writings, particularly those of the Ari Zal which at that time were at the height of their popularity. Ironically, R. Kahana adds in a footnote that some have argued that Sabbateanism itself was responsible to some extent for the popularity of the Ari Zal’s teachings! The response to R. Landau letter was quite surprising. 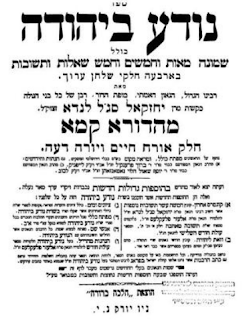 The rabbis of Brody - while agreeing in principle to the ban on the various publications because of suspected Sabbatean heresy - felt that R. Landau had actually not compromised but had in fact been too harsh on R. Eybeschutz by condemning the amulets! And, even the ban on the publications which they partially agreed to, was not really taken seriously and may have been lip service more than anything else. Thus R. Landau’s letter was not as effective as he thought it would be. “Now, regarding the words of the Zohar, I do not wish to speak at length. How I am angered by those who study the book of the Zohar and the Kabbalistic literature in public. They remove the yolk of the revealed Torah from their necks, and chirp and make noises over the book of the Zohar, thus losing out on both, causing the Torah to be forgotten from Israel. 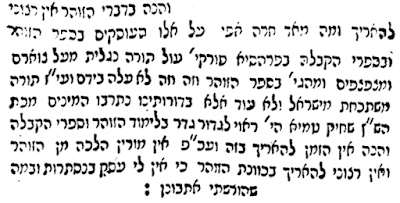 Amazingly, in this Halachic responsum, R. Landau appears to call for a blanket prohibition against the study of the mysticism of the Zohar and Kabbalaistic texts, in order do away once and for all with the possibility of the merging of a genuine mystical system with that of a secret Sabbatean mystical system! The printed editions of Noda biYehuda do not provide a date for this last responsum banning the study of Kabbalah. However, in a notebook of R. Pinchas Katzenellenbogen (who originally addressed the query about the shapes of the letters of a Sefer Torah to R. Landau in the first instance), there is a date which corresponds to Friday, February 20, 1756! Jacob Frank had, about two months earlier, just crossed into Poland as part of his campaign to solicit support from Polish secret Sabbatteans. And just a few weeks prior, Jacob Frank was caught in a Sabbatean nihilistic ritual which resulted in arrests, accusations and counter-accusations. This sparked an intense confrontation between the rabbis and the Frankists under the ‘patronage’ of Bishop Dembowsky. Eventually, the tensions culminated in religious debates in Kamenetz Podolsk (where copies of the Talmud were burned) and Lvov, with Jacob Frank converting to Christianity together with many of his followers. R. Katzenellenbogen’s question to R. Landau just happened to arrive at the beginning of this tumultuous period. This may have prompted R. Landau referring to ‘an increase in the heretics’ at that precise time. And this may explain why R Landau was prepared to revert to such an extreme measure as banning the study of Kabbalah. This time the rabbinate responded more swiftly and directly to his call and issued a writ of excommunication against the Frankists. They did not ban the study of Kabbalah, but they raised the minimum age of study of Kabbalah to thirty years, and of study of the Ari Zal’s teachings to forty years of age. A short time later this writ became officially known as ‘The Double-Edged sword’ and became the official protocol of Eastern European Jewry. These included Greater Poland, Little Poland, Ruthenia and Volhynia. Some put the date at 1752. The Allure of Forbidden Knowledge: The Temptation of Sabbatean Literature for Mainstream Rabbis. Torat haKenaot (Altona 1752), 71b-72a. Shvirat Luchot haEven (Altona 1757), 31b. The Jews of Hungary: History, Culture, Psychology, by Raphael Patai, p.228. Luchot Edut (Altona 1755), p. 41. 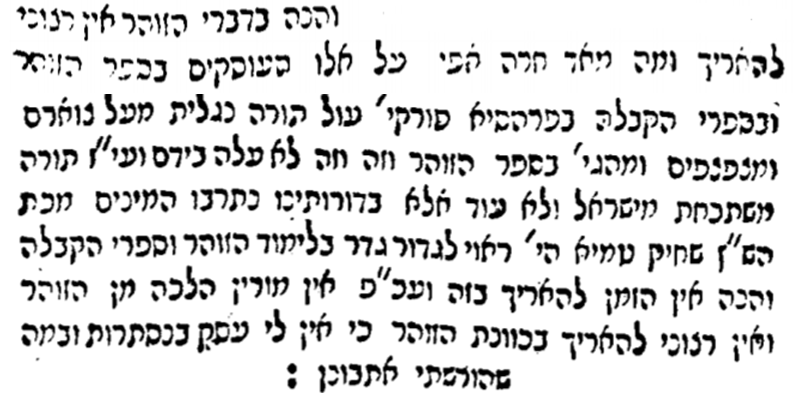 Petach Enayim (Altona 1755) 7-8. Halperin, The Records, sections 750-53.
more about this here, as well as other articles. 221) R. ELIYAHU HABACHUR – TEACHING KABBALAH TO CARDINALS? 219) ACADEMIC OR TRADITIONAL TALMUD STUDY? 166) DID THE HIGH PRIEST HAVE A ROPE TIED AROUND HIS ANKLE? 120) RAV KOOK ON G-D, RELIGION AND THE ATHEIST. 102) DID ST. PETER COMPOSE THE 'NISHMAT' PRAYER?